Nothing can strike fear in the heart of even the most steadfast believer in Messiah these days more than the call to disciple a new believer. Sadly, the average church go-er is completely unprepared to teach his faith to others. The church’s great commission, described in Matthew 28, commands believers to make disciples, not converts. Yet the church’s monumental focus is for converts, not to mention giving-units. Say the magic prayer and be counted in our number. This has yielded generations who cannot articulate what they believe, from where their faith came, or for which fundamentals they will fight. Young people are sent off to college where they interact with other faiths better prepared to argue from reason, from emotion and from their scriptures. Atheist professors, government-enabled Muslims and lovable Jehovah’s Witnesses are stealing thousands from the generational faithfulness that is common in Orthodox Judaism. Peer pressure is the greatest threat to young people leaving home and entering the workforce, or attending a distant university. How can this threat be minimized – or better, neutralized? Discipleship. This is no great revelation. We must wrestle not with what the cure may be, but rather where the cure is applied. Many would venture that the church is the medium by which we disciple believers. I strongly disagree! The Scriptures teach that we should not forsake the assembling of ourselves together[i], and there are examples of gathering for prayer[ii]. Are these not the reasons for us to gather, but for prayer and fellowship? The training up of disciples is not done when we come together in this way. G-d teaches us that the responsibility of training up and ensuring multi-generational faithfulness is done in the home[iii]. In order to shore-up the missing generations of faithfulness, we must rebuild the men of our society. We must train fathers to teach their wives and children what it means to be faithful to G-d. To that end, we have established a weekly, two-hour yeshiva class comprised of new and seasoned believers helping men grow in their walk before HaShem (The Name). The goal is to become a tzadik (righteous man). Yeshua (Jesus) was an orthodox Jewish rabbi, and as such, was an expert in keeping the Torah, and demonstrating His love for the Father through His obedience. Add to this that He also happened to be the Mashiach (Messiah) and the Living Torah, and we begin to realize that He is the very expression of the Holy One. Discipleship is the art of imitation. So let us mimic the Master in every way, every day, and we too shall know the Father in ways far beyond our current comprehension. As men, and men-in-training, we should seek wisdom, as we learn to walk in obedience to G-d, so we may become leaders in our families and communities. Let us share insights with one another and hold each other accountable to righteous deeds (mitzvot). As these discussions progress, may we never forget that “it is not what we say or think – but what we do” that lasts for eternity. Hope all is well….Is there any way of speaking with someone from this blog. Please email me as i want to speak to someone about some important topics! Thank you and G-d bless. Thank you so much for creating this. 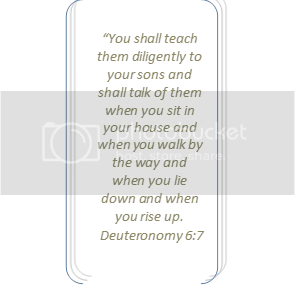 I have been looking for resources which honor YHWH and I can use in teaching my boys in homeschool. This site is wonderful! Thank you very much for your kind words. Do you use other resources for home schooling as well? It is our prayer and intention to be a resource for men serious about the Torah and living a life set apart for HaShem. May we all bless our Creator in thought, word, and deed.